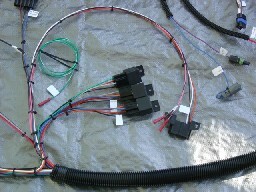 For the Street Rod or Classic Muscle car this wiring harness will allow a very clean and professional installation. This harness comes complete with all of the connections that are needed for you to plug this into your GM TPI and run. It has all of the un-needed emissions equipment removed for instance, EGR solenoid, EVAP canister purge solenoid, AIR diverter valve, AIR selector valve and EGR temp switch where applicable however this is not a bare bones wiring harness. The harness also comes with the 700R4 lock up control for the transmission and the MAP sensor plug is in the engine bay where it can be mounted on the firewall. It isn't shown here but the TPI harness is set up like all of the other FIC harnesses at the ECM, Fuse Block, ALDL Data Link, Fuel Pump Relay as well as some miscelanious output wires. The harness is also covered in the corrugated split covering that GM uses in their products at no charge. If you have a 1994-95 TBI engine and transmission that will become part of a project then check this out. The transmission, 4L60E is an electronic transmission and requires the ECM to do all of the shifting and down shifting. Most of us are not into the electronics being part of the transmission but think about it, with the ECM controlling the shifting and down shifting, it makes it easier to modify the shift points. Shift later, shift sooner, hold first gear longer etc. This harness will get you there with a pull out engine from a 94-95 GM truck. 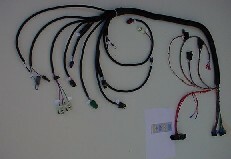 We sell this harness for people wanting to install a 4L60E into a non computerized engine and car as well. People have used this harness to do the transmission conversions like putting a 4L60E or 4L80E behind an older engine, yes even CARBED engine. 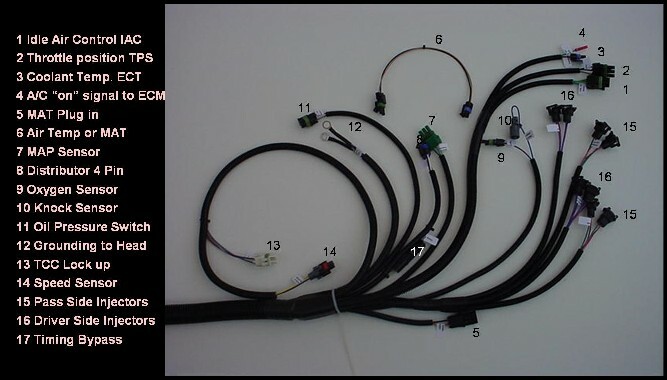 The harness has the RED and BLUE connectors for the ECM numbers 16197427 or the 16196395 ECM only. To do a conversion you will need the following signals to the ECM, coolant temperature, MAP sensor, engine RPM and Throttle Position Sensor. These do require the original type of speed buffer or “DRAC” module to calculate speed by tire size and gear ratio. You can get a module from almost any speedometer shop or we offer the modules as well. We need to have the rolling diameter of the tire and the gear ratio. Don't make it up because the module is not returnable for any reason. Check out Jags that Run for what they have to offer in the way of speed buffer modules, they are adjustable and seem to be a good product. Set up about the same as the speed density version of the TPI, this MAF equipped harness will allow you to use a 1986-88 MAF TPI engine. A common question is "does the harness come with the MAF ON relay and the MAF Burn Off relay? Yes it does. The FIC MAF harness has all of the function as the stock engine would have. The ESC (Electronic Spark Timing) Module as well as the relays are relocated to where the ECM is to be mounted to allow for a cleaner engine bay. The ALDL data connector is also located there. The harness is also covered in the corrugated split covering that GM uses in their products at no charge.